Bettina, aka Juki Bettina, is a beautiful, 2-year-old brindle female born July 7, 2007! Her sire is Gable Oscar, and her dam is Gable Butterfly. 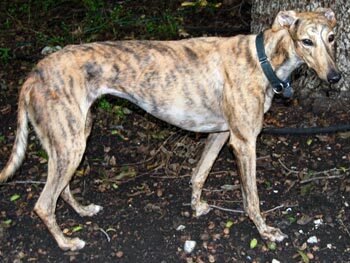 Her brindle markings are most unusual, especially on her face. 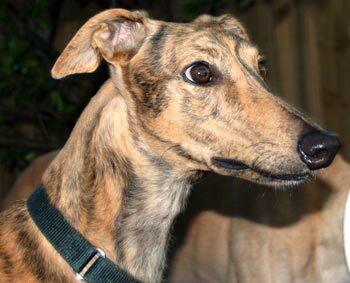 Bettina was not a contender in the racing arena, so is ready to find her place in the adoption world. Being born on 7/7/07 makes her one lucky gal! Bettina is cat tolerant but has not been tested with small animals yet.